Grass trimmers, or strimmers, as they are commonly known, are ideal for reaching areas of your garden that lawnmowers just cannot go. Modern trimmers are multifaceted, slight of weight and weigh very little compared to older versions. Grass trimmers are perfect for: Keeping the edges of your lawn neat and tidy, cutting steep grassy banks in your garden and trimming the bottom of fences and walls. How does a grass trimmer work? Trimmers have a nylon cutting cord that protrudes from the head of the trimmer. Centrifugal force gives the cord strength; as the nylon spins faster it becomes more rigid, allowing it to swiftly dispense of pesky grass and weeds. You can purchase models that require that you change the cord each time it wears down or breaks by hitting various obstructions in your garden. On other models, there is a spool filled with yards of cord mounted in the head, which automatically feeds fresh nylon to the trimmer as required: The advantage to this setup is that you are only required to change an entire spool, rather than frequent line replacements required by models with a single cord design. There are also double cord design trimmers that provide you with higher performance in areas of the garden which have heavier growth. 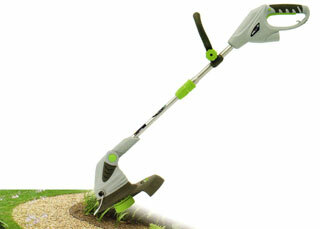 Rotating head trimmers offer even more versatility to help maintain the edges of your lawn and garden. 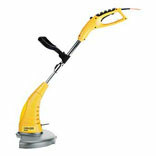 The head rotates up to 180 degrees, allowing you the right trimming angle for different circumstances. Your lawn edges will be the envy of neighbours and your entire body will benefit too, since you will not have to kneel down and contort your back in different positions like you would if trimming difficult areas by hand. Try to envision all the areas that need attention before choosing your trimmer. You do not want to purchase one that is meant to trim small areas if your lawn is quite large. You also do not want a heavy duty garden trimmer for a small area, as their increased power and cutting swathe is less gentle and obliging to delicate areas. Maybe you only have a small area around your home and garden that will require regular trimming, where a light duty model will do fine. However, you may have larger areas with mounds of goose grass, or stinging nettle that need monthly or bi-monthly attention. If this is the case, you need to go for a model that has more power and a wider cutting swathe - to get the job done in less time, with minimal aggravation. Smaller swathe trimmers are lighter, more manoeuvrable and lend themselves to tighter, more inaccessible areas along borders and walkway edges. They also allow you to get under shrubs and hedges with ease. 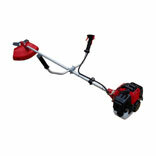 As we mentioned above: The way the cutting line attaches to your lawn trimmer varies from model to model. If you are in need of a trimmer for an occasional light duty trim, then a basic model that requires you to replace a broken cord with a new one should be ideal. You don't have to worry about an automatic spool jamming with this design. If you are prone to large trimming jobs where the nylon is more likely to break, consider an integral spool model which automatically feeds new line as needed. This design allows you to do multiple trims, without the nuisance of constantly stopping to change your line. You could also consider a bump feed trimmer - bump feed designs feed the trimmer new line when you hit the bump mechanism on the ground, giving you more control over how much line gets used. This type of trimmer offers the advantages of the automatic feed, but allows you to monitor which areas of your garden and property use the most cord. This allows a user to adjust their cutting habits to cut down on line usage. The decision between auto or bump style is merely a matter of preference - both offer extended use without stopping to change your line all the time. Electric trimmers offer convenience of use. As long as an outlet is present, they can be used whenever you wish - with no forethought of charging (rechargeable), or making a trip to the petrol pumps. A close power supply is needed to operate. If you lose focus temporarily you may cut the mains cord by mistake. Portable, you have the flexibility to use the trimmer anywhere. No power cord to accidently cut through, making them safer than corded power trimmers. Batteries are often interchangeable with other cordless power tools from the same brand. You will be lucky to get 40 minutes of trimming time before the battery starts to drain. You are required to plan ahead and have the batteries charged prior to use. This can mean starting your charge 5-7 hours in advance for a 20 minute trim job. 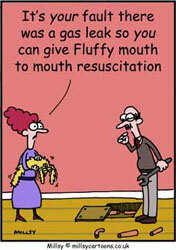 Need to plan ahead and remember to charge the batteries prior to use. Batteries need to be recharged for 5-7 hours to provide approx 30-40 minutes run time. Charger and/or batteries can get lost. Battery life also lessens with use over the years. Similar to the rechargeable models there are no electric cords to cut through, making them safer than a cord powered trimmers. A petrol engine offers more power than electric and battery trimmers - so they are great for bushy overgrown areas. Like the rechargeable trimmers, they are fully portable and can be used anywhere. They are bulkier machines making them more difficult to handle and harder to manoeuvre. A ready supply of petrol is always needed. Some people in urban areas do not like storing petrol in their garage, shed, etc. Petrol trimmers are too noisy for some people's fancy, and the exhaust smell is undesirable to some. The trimmer must compliment your height, so you are not required to bend over all the time. 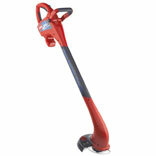 Be sure to buy a trimmer with an adjustable shaft - this will allow you to adjust the shaft length to suit your height. If you plan to use your machine for long periods of time a second handle will be a required feature, it will allow you to steady the machine and distribute the weight, better for large gardens. Some models come with an extension to support your wrist, allowing you to endure large trim jobs with maximum comfort. Protect yourself by wearing safety work boots, and safety goggles. Keep children and animals away from the area you are trimming in. Place electrical cables away from the direction you are cutting. Ensure your electrical socket has RCD protection. In wet weather do not use your electric trimmer. Read, understand and follow the manufacturer's instructions before using your trimmer.